Since some years, the clear idea that comes to me sometimes is that AOR/Melodic Rock is being reborn. Yes, because there are many albums of this particular genre being released, a lot of new bands are arising, old bands coming back to life, so these are signs of something coming. I hope that the genre can come back fully, as a commercial success throughout the world, as it was in the end of the 70’s and beginning of the 80’s. 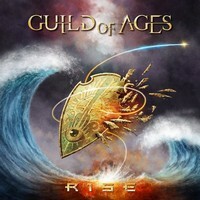 In those days, a band as GUILD OF AGES would be a great success, because the music we find on “Rise” would fit perfectly on the radio. On the album you’ll find excellent melodies, fine choruses, and all accessible musical elements that were the recipe for success. Their musical work is on the same vein of names as BON JOVI and JOURNEY, but with their personal touch, and it isn’t sounding outdated in any moment. So, you’ll enjoy a very good time hearing these charming and musically accessible songs. On the sound quality, you can bet your cards that you’ll find something loud and clear, obviously using and abusing of the keyboards to create an accessible feeling. But be prepared for the aggressive modern tunes used for guitars in some moments (even is nothing as aggressive as some nasty Glam Metal approach we all known). Let me tell you a thing: it’s very good in the way it was created. Leaving aside the introduction and the outro, we have ten very good songs, and the charming moments of “Deep in Heaven” (very good guitars), the catchy taste of AOR given on “Around the Sun”, the modern and heavy feeling used on “Addicted” (where bass guitar and drums are creating a strong rhythmic basis) and on “All Fall Down”, some atmospheric and ethereal elements of “Awaken”, and the Rock ‘n’ Roll thrust of “I’ll Keep Burnin’” will be the right shots for you to love this album. Hear it out loud and see what GUILD OF AGES is up to.